Prairie View University has a long history of political engagement, but for the first time several students ran for local office and won two open seats. That was 2015. By 2016, Donald Trump—who ran on a campaign that promised to give more power to the police—was president. President Obama’s farewell address included a call to those listening to “grab a clipboard, get some signatures, and run for office yourself,” encouraging students to be the change they’d like to see. Three Prairie View A&M students took the former president’s advice, running for the two open seats in Prairie View City Council. On May 6, both seats were filled by Prairie View students, one of whom is the youngest city council member in the state of Texas. The results, according to Frank Jackson, former mayor of Prairie View and now Assistant Vice Chancellor for State Relations–Texas A&M System, show the power of young voices in the community. “If the students ever became truly organized, they could hold every political office in the city and key political offices in the county,” Jackson said. Maduforo Eze, who has been a member of PVAMU Student Government Association since his freshman year, ran for Prairie View City Council Position 2, but lost to the incumbent, graduate student Jonathan Randle. Eze now serves on the university’s student government as vice president of governmental relations and external affairs and, despite his loss, said he will continue to participate in local government. Founded as a part of the Morrill Land Grant Colleges Act, Prairie View A&M University, and Texas A&M University were both part of the public education initiative of former slaves, established during Reconstruction by some of the first black members of the state legislature. Students are versed in the history of the school’s founding and student activism and participation in the political process make up a significant part of campus life. The university holds voter registration drives the moment students step on campus; freshman at orientation take turns packing the auditorium in the student center to listen to peer advisory leaders, administrators, and city politicians who encourage them to be the change they would like to see. And each voting season, the students, who not only make up a large part of the voting power of the city but the county as well, line up to exercise their rights as citizens. Political engagement, especially the fight for the right to vote, is embedded in the university’s history. In fact, Prairie View A&M University students are the reason that students across the country can vote in their college counties as residents. Before the 1979 Symm v. United States Supreme Court decision, students at Prairie View had to complete residency questionnaires before they could be registered in Waller County. The questionnaire placed an undue burden on students, violating the 26th Amendment; in upholding a district court’s decision, the Supreme Court gave students across the country the right to vote on their college campuses. However, the court ruling didn’t put an end to voting disenfranchisement at Prairie View A&M, nor the students’ fight against it. In 1992, hundreds of Prairie View students marched to the Waller County Courthouse to protest the arrest and indictment of 19 Prairie View students for improperly voting, charges that were later dropped due to lack of evidence. In 2004, Waller County District Attorney Oliver Kitzman contested the votes of Prairie View students in a local election. Despite the 1979 Supreme Court decision that gave students who were not residents the right to vote on their college campus, Kitzman said their voting violated state residency laws. After more than 2,000 students marched alongside US Representative Sheila Jackson Lee and Texas State Representative Al Edwards, Kitzman dropped the challenge. Students took this a step further when, in 2008, they protested the lack of early voting sites on campus. 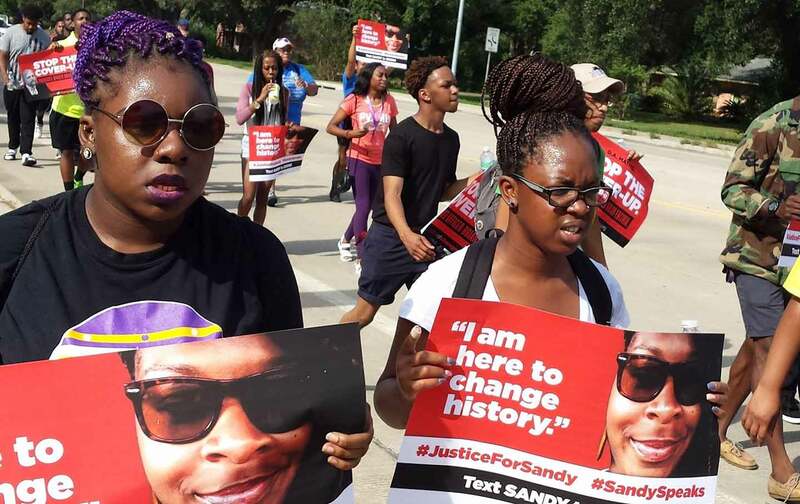 On the first day of early voting, in efforts led by the SGA president André Evans, over 1,000 students marched for two and a half hours on a seven-mile trek to the Waller County Courthouse from campus. Finally in 2013, bolstered by the efforts of the then-SGA President Priscilla Barbour, Mayor Frank Jackson, and PV Alums, student were granted campus voting sites. The presidential election of 2016 was the first in which students could vote on campus. Jae JonesJae Jones is a Southern writer of culture, history, and civil rights.